Learn to construct bass lines in a style you have never played. Start with a simple bass line and the corresponding drum groove and take it from there. Once you know what fits create your own lines! 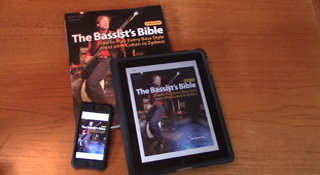 "The Bassist's Bible is a great tool, something I wish I had had when I was coming up." Reviewed by Bass Player Magazine! "This cool new book seeks to describe all that the average player will need to know" … "with nearly every common musical style." Learn to play bass lines in any style! 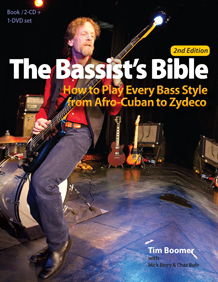 The Bassist's Bible is a book written by Tim Boomer with Mick Berry. The new 2nd Edition is an update and expansion of the original version which was published in 2009. It provides bass patterns for virtually all popular styles, and includes more than 400 bass grooves now in both standard musical notation and tablature. Each chapter covers particular styles or families of styles. These contain both primary examples and variations on those examples. The history of the style as well as characteristics such as tone, gear, guidelines, and chord progressions are included along with an extensive discography, glossary, and an appendix for Standup bassists. The printed book with 2 CDs and 1 DVD is available now online and in stores. The 2nd Edition e-Book with embedded audio and video files is also now out everywhere. We had specific versions of the e-Book optimized and tested for each platform. As long as your e-Reader has the capability to play them, the multimedia files will work on your hardware/software. Learn the way you want to! The 192 audio examples are now twice the length on the two CDs (recorded with their corresponding drum grooves.) In addition there is a DVD with 92 video examples showing three camera angles. 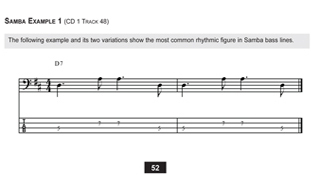 The short examples can be used to help you to learn to read music in standard notation while also learning useful bass lines. 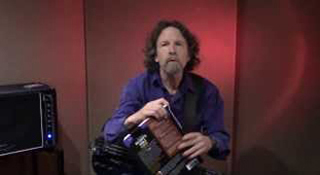 In addition you can use TABs as an alternative way to understand and play the grooves . For those of you who are paper-adverse and wish to save trees the e-Book is also available for your phone and tablet. All the audio and video assets are embedded so you can learn the way you work best - by reading, listening, or watching.